When New York is in your travel plans, hiking probably isn’t the first thing that comes to mind. But urban hikes through the city are an excellent way to see the sights, experience the neighborhoods and get some exercise while you’re doing it—because you know you’re going to be dining on some amazing cuisine while you’re there. Here are 5 of my favorite urban hikes in New York City. Built on a historic freight rail line, the High Line stretches from Gansevoort Street in the Meatpacking District to 34th Street along Manhattan’s west side. This elevated walkway has become one of New York’s top attractions. There are plenty of highlights along the way including the Chelsea Thicket—a two block section of the pathway that meanders through a miniature forest of dogwoods, bottlebrush buckeye, roses and various other trees and shrubs. Original railroad tracks are embedded into the walkway as a nod to the path’s original identity. Between 14th and 15th Streets the walkway is lined with lounge chairs filled with sunbathers during the day and those looking for the best seat in town to catch a sunset over the Hudson River. Train lovers will appreciate the area around 34th Street that overlooks the train yard outside of Penn Station. Brooklyn Heights was one of the first neighborhoods of commuting New Yorkers in the 1800s earning it the title of “America’s First Suburb.” The historic neighborhood has retained much of its 19th century charm with quaint tree-lined streets flanked by stately mansions and lovely brownstones. The Brooklyn Heights promenade runs alongside the East River where stunning unobstructed views of Lower Manhattan are the main attraction. It’s one of the most romantic spots in New York City and an ideal place for a first date, proposal or a not so romantic stroll with the kids. Lined with flower beds, trees, playgrounds and benches, the promenade stretches one-third mile with views of the Statue of Liberty, the historic Brooklyn Bridge and the Manhattan skyline. The Little Red Lighthouse stands beneath the George Washington Bridge in Upper Manhattan and the Hudson River Greenway will lead you to it. Stretching 11 miles, the greenway spans the entire length of Manhattan’s west side. Besides finding the Little Red Lighthouse, along the route are sculptures, benches, railroad memorabilia, midtown piers and plenty of riverside cafes. The trail passes through Fort Washington Park, Riverbank Park, Riverside Park and the Hudson River Park before finishing at Battery Park at the southernmost tip of Manhattan. Malcolm Cochran’s Private Passage is an eye-catching sculpture along the trail. It’s a 30’x 8’6” giant wine bottle resting on its side. Inside is a representation of an interior statement from the ocean liner, Queen Mary. Doing the full greenway will take most of the day but there are plenty of greenspaces for picnicking and riverside cafes along the trail to help you recharge when needed. Built in 1848, the High Bridge (originally known as the Aqueduct Bridge) is the oldest bridge in New York City. After being closed for over 40 years, the bridge reopened as a pedestrian walkway in 2015. The steel arch bridge rises to a height of 140 feet over the Harlem River connecting Manhattan with the Bronx. Historical markers along the walkway provide a glimpse into New York City’s history. The eastern end of the bridge is located in the Highbridge section of the Bronx near the western end of West 170th Street, and the western end is located in Highbridge Park in Manhattan where the 200-foot octagonal High Bridge Water Tower stands watch. Sculptures throughout the park provide an artistic touch to this historic section of the city. 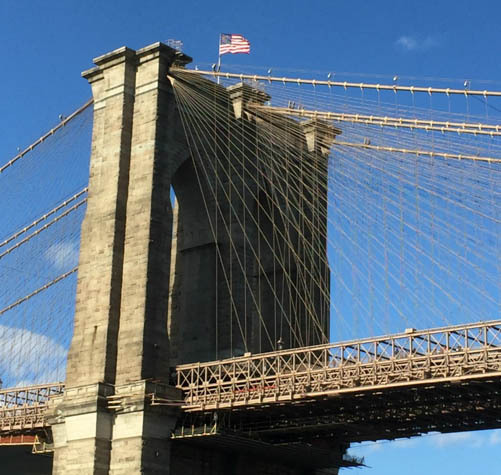 One of the country’s oldest suspension bridges, the Brooklyn Bridge is a New York City icon. Completed in 1883, the bridge spans nearly 1600 feet across the East River. A stunning structure with Neo-Gothic towers, the Brooklyn Bridge is a majestic symbol bridging New York City’s past with its present. And it’s one of New York’s most popular walks. It’s an easy 1.2 mile walk each way on the pedestrian walkway which is situated above the bustling traffic lanes. You can walk it from Manhattan to the Bronx or vice versa. Personally, I prefer to take the subway to Brooklyn and walk back to Manhattan. Take the A or C train to High Street or the 2 or 3 train to Clark Street and walk to the bridge entrance. The Manhattan skyline unfolds before you and Lady Liberty is in view in New York harbor. There’s nothing quite like walking the Brooklyn Bridge just before sunset, and watching the lights of the city come alive just as the sun disappears. It has always been one of my favorite New York experiences. Have you tried any urban hikes in New York?